The 2019 Toyota Corolla Hatchback is an all-new vehicle for 2019. Thanks to its roomy cargo area, small starting MSRP, and feature list, it’s the perfect choice for active drivers who want extra versatility for cargo but don’t need the interior space offered in a larger crossover. 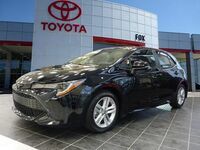 The 2019 Toyota Corolla Hatchback comes well equipped with a few new features for the Toyota lineup for 2019 including an Adaptive Front Lighting System, Apple CarPlay, Amazon Alexa, and the upgraded Toyota Safety Sense 2.0 active safety bundle. Keep reading to learn more about the pricing, trim levels, and features found in the 2019 Corolla Hatchback or click the link below to go straight to the 2019 Corolla Hatchback inventory available now at Fox Toyota in Clinton, TN. The 2019 Toyota Corolla Hatchback will be available in two trim levels: SE or XSE. Both trims will offer two configurations including a base option with manual transmission or an available automatic transmission-equipped variant for a little higher starting MSRP. Even base 2019 Corolla Hatchback models come well equipped, so the choice between models will ultimately come down to personal preference and an interest in some of the advanced features found on the XSE trim including blind spot monitoring, dual-zone climate control, and an Adaptive Front Lighting System. The 2019 Corolla Hatchback SE with a manual transmission starts at $19,990 and comes packed with standard features including LED headlights, heated side mirrors with turn signal indicators, split-folding rear seats, selectable drive modes, Apple CarPlay, Amazon Alexa, two USB ports, and Toyota Safety Sense 2.0. SE models with automatic transmission will start at $21,090. Drivers interested in upgraded features like LED fog lights, an Adaptive Front Lighting System, 18-inch wheels. Dual-zone climate control, a 7-inch dashboard display, leather-trimmed heated seats, an available Qi-compatible wireless charging pad, and Blind Spot Monitoring can move up to the base XSE model for a starting MSRP of $22,990. Automatic transmission will bump the starting price up a little higher to $24,090. For more information on the 2019 Toyota Corolla Hatchback model, contact a member of the Fox Toyota team via phone at 865-407-2245 or in person at the dealership during normal operating hours. Interested in a 2019 Toyota Corolla Hatchback?